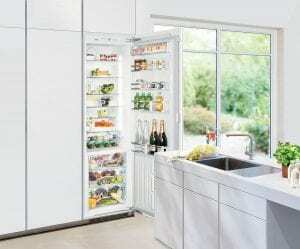 At Appliance City, we carry fridges from a wide range of manufacturers, and if you’ve ever stopped to think how does a refrigerator actually work? Then we’re here to tell you how. 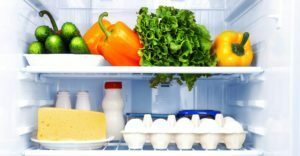 The household refrigerator has become so commonplace that you forget that there’s actually some clever mechanisms within it that allows us to keep our food cold, fresh and tasty. This is the basic scientific premise behind refrigerators and air conditioning units, from mini bar fridges to central heating to fans in a car. The air conditioning working principle is another way of explaining how a refrigeration system works. The scientific principle behind it is that warm air is replaced by cold air through the process of evaporating and condensing of a refrigerant. What is a refrigerant? Refrigerants are used in both air conditioning units as well as fridges. They are often either in a fluid or gaseous state and are used by your household refrigerator to create the cold temperature that keeps food fresh. The refrigerator takes the refrigerant and uses the evaporator to, you guessed it, evaporate it. The act of evaporation cools down the surrounding area. Refrigerants tend to have a low evaporation point to make this easy work for your fridge. The expansion valve releases the refrigerant and works with the evaporator to create this effect. It works in much the same way as an aerosol can. However, if it just did this, you would constantly be filling it up with refrigerant. This is where the condenser and compressor comes in. After evaporation, the refrigerant is in a gaseous state. The compressor and condenser transform the cold air back into a liquid. The compressor pumps the cold air and this compression causes the air to heat up. Compression also pressurises the air. This hot, pressurised air is then channelled into the condenser which cools it down to return the gas to a liquid state. This liquid is then evaporated and it’s this process that keeps your fridge nice and cool. This also explains why the back of your fridge can get quite warm or even hot as this is where the pressurisation is done. The coldness is a product of evaporation and this process is what keeps the main refrigeration chamber cool. What Gas is Used in a Refrigerator for Cooling? There’s been a number of different refrigerants over the years since the first household refrigerator was invented in 1913. The first refrigerants are what is known as hydrocarbons. Examples of hydrocarbons are isobutane and propane. These were then replaced with chlorofluorocarbons (CFCs). CFCs were replaced by hydrofluorocarbons (HFCs) after CFCs were discovered to deplete the ozone layer. Since then, we have gone full circle and manufacturers across Europe, Asia and South America tend to use hydrocarbons as refrigerant as HFCs were also found to be detrimental to the planet’s health. Hydrocarbons depend on non-renewable resources for their existence but at the moment, appear to the lesser of all evils. Now you know how they work, it’s time to start looking for a brand new fridge! For our full range of fridges, click here. We have fridges from top international brands like Smeg, Samsung, Liebherr and Miele as well as British businesses like CDA. With great prices across the board on smart and powerful appliances, save money when you shop with Appliance City!